A CUT ABOVE The ribbon-cutting ceremony at IDEA PCS with (from left): DCSCTF COO Carol Randolph, Miller & Long Chairman John McMahon, D.C. Council Member Yvette Alexander, IDEA Principal Lanette Bacchus and IDEA PCS Board Chairman David Owens. A massive poster stretches across the side of the school. 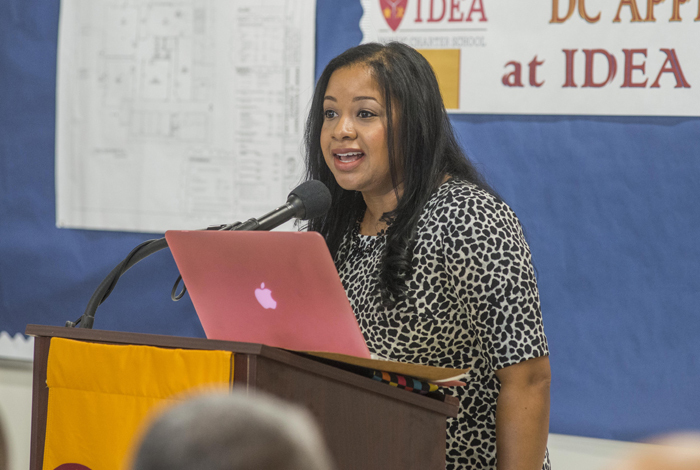 On it, are the words signaling a new direction in learning: “Build your career at IDEA with the Academy of Construction and Design.” It’s the “sequel” for a program aimed at bringing skilled trades to young people throughout the District, and particularly to those living in Ward 7. 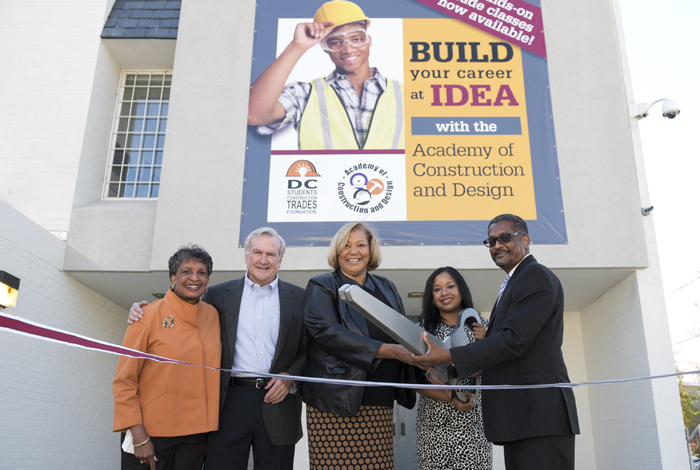 Alexander joined IDEA, D.C. Students Construction Trades Foundation, D.C. Public Charter School Board, and city government leadership Nov. 4, 2015, to unveil the Academy of Construction & Design in its new home. “This is the sequel, and we’ve got some new players,” declared Shelly Karriem, director of the Academy of Construction & Design. Starting in ninth grade, students enrolled in this career and technical education program are exposed to nontraditional classroom skills in electrical, carpentry, and heating, ventilation and air conditioning. Instructors teach students technical studies in math and science, and other areas that come in handy in the field of construction. Students dressed in crisp Junior ROTC uniforms greeted a steady flow of guests entering IDEA Public Charter School in Northeast. Ahead of the official ribbon-cutting ceremony, attendees filled seats of the “renewable energy” classroom – in eyeshot of one of the technical classrooms filled with specialty equipment, like an electrical workstation. The crowd also included students, many who are being exposed to the skilled trades for the first time through this program. A BRIGHT ‘IDEA’ Students turn out for the grand opening celebration of the Academy of Construction & Design. “We get to work hands-on, that’s the best part,” said McGill without hesitation. Although his first love is football, he chose to enroll in the program as a safety net that could give him a jumpstart in work experience after high school. He’s also anxious to get started on the Youth Farmer’s Market, expected to launch this spring. There, Academy students are planning to grow and sell fresh fruits and vegetables to the surrounding Deanwood community. They will also provide fresh food alternatives to the school. Another of McGill’s goals: to work on the micro-house, which on this day, is parked in the school’s back lot. “That’s who we’re after, a kid that age to get their head in the game,” explained John McMahon, president of the D.C. Students Construction Trades Foundation. Working together with IDEA and its staff – both of which have been “all welcoming” of the Academy into its academic fold – brings together complementary disciplines that are mutually beneficial, particularly for the students. “What’s unique here are the existing programs – the [Junior ROTC], the architectural design – it’s like putting on two gloves that totally fit,” said McMahon. And IDEA leadership agrees. David Owens, chairman of the IDEA Public Charter School Board of Trustees, is among those who’ve embraced this concept for learning that aims to benefit both students and community. For one, said Owens, adding the Academy aligns with IDEA’s overall mission, which includes preparing students for opportunities after high school – college, military and now the chance to learn marketable trade skills. 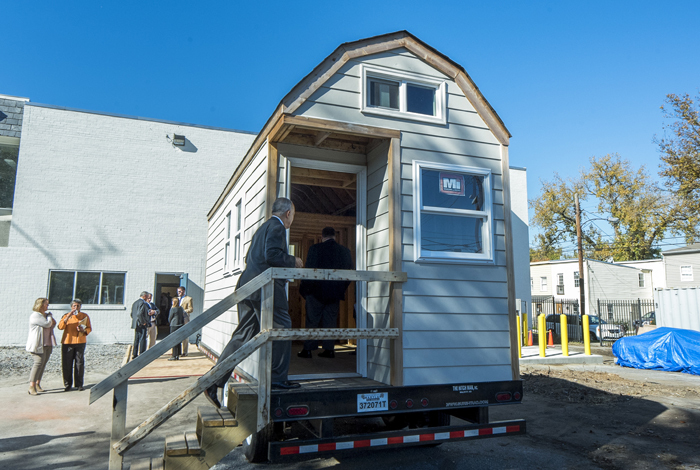 TINY HOUSE, BIG DREAMS ACAD students have completed the exterior of the micro-house project. Next step, building out the interior. “There are other skills that students can possess and be professionals. There is value in working hard and being part of rebuilding the community,” explained Bacchus. She stressed that the Academy will not only teach students the technical component of a career, but also “grit and stamina” in an age of instant gratification. ON DUTY, ON BOARD IDEA Principal Lanette Bacchus gives kudos for the Academy opening more doors to students. The new space will also house the D.C. Apprenticeship Academy, a construction apprenticeship program for adult learners. 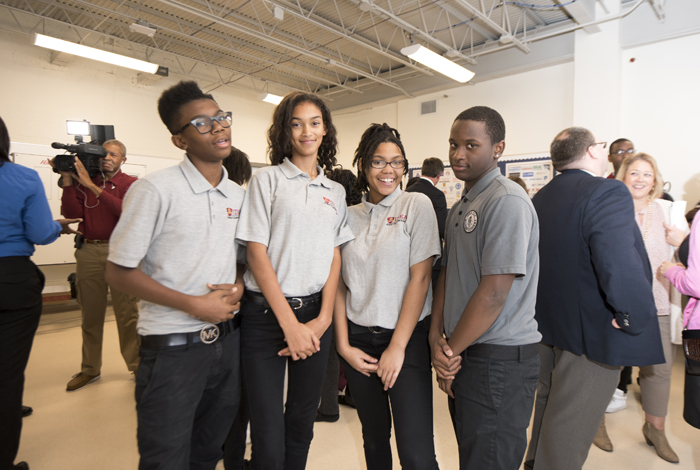 “This city went in the wrong direction when it de-emphasized apprenticeships,” said Scott Pearson, executive director of the D.C. Public Charter School Board, during the ceremony, noting that apprenticeships, trade schools and career academies are essential to the college and career discussion.